Translation: Mio Ota. 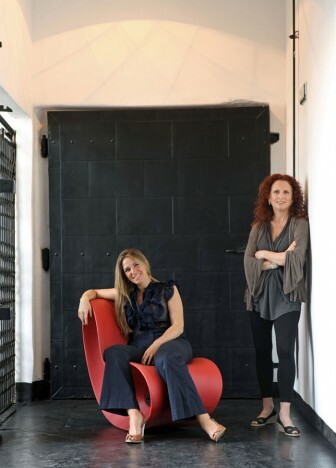 Discover The WOW Factor, the amazing project of two amazing women. CECILIA NIGRO: Before starting Wow, I was responsible for seven years of working with great success in the marketing and positioning of the Alvear Hotel in Argentina, Latin America, USA and Europe. I also worked with other five-star “Leading Hotels of The World” traveling around the world spreading the word about Argentine Luxury. I have a bachelor in Public Relations, a Master degree in Communication Management and Im also graduated in Communications from San Diego State University, California. MARIANA RAPOPORT: I started my career as journalist in newspaper Clarín where I worked as an investigative writer. I also worked as gourmet-beauty and travel editor in Elle and later on I became the editor in chief of Elle Decor. Since 1999 I´m Walpaper´s correspondent in Buenos Aires. In the year 2002, I created Surpressagency, a boutique photo agency specializing in architecture, design and travel. I have a major in journalism and I won several scholarships, including World Press Institute and Fulbright. THE PROJECT: We created The WOW Factor, a new concept in consulting, three years ago. Our goal is to awaken the potential of lifestyle projects in order to transform them into successful businesses with high visibility. To do so, we have created a powerful methodology that works on the essential and emotional aspects operating a business and after analyzing the DNA, we design tailor made solutions for each project. We strongly believe that when a venture can generate a WOW experience, it increases profitability and generates a strong customer loyalty. Due to the diversity of the projects and the services we offer, we are head of a multidisciplinary team of the most influential professionals specialized in hotels, restaurants, interior design, architecture, marketing, sales, communication, technology, photography and management. In which projects have you been working lately? We have been working in awide range of projects, from small to large scale. From redesigning the concept, interior design, look and feel and communication of a hotel located in the heart of Buenos Aires, to help building the identity and positioning of a market leader black card and a one on one consultancy sessiones with an entrepreneur with his design project. We are also responsible for the communications and the social media strategy of a couple of the hippest restaurants in Palermo neighborhood. Buenos Aires is one of the most vibrant and most appealing capitals in South America. The city has a buzz all of its own, dizzying mix of Europe and Latin America, Spanish colonial and contemporary architecture, laid-back and fast-paced, gourmet cuisine, cutting-edge designer boutiques, ritzy neighborhoods and a frenzied nightlife. Please tell us about your favourite places in Buenos Aires. Olsen, an uber-stylish restaurant serving Scandinavian cuisine, overseen by chef Germán Martitegui, who also runs CasaCruz and Tegui. The decor –recently redesigned- is super cool, with copper lamps, a central ound metal fireplace, a decked outdoor lounge and a beautiful garden overgrown with plants. Starters such as tiny pancakes, smoked salmon, smoked herring, caviar, and flavored cheeses and butters. Les Croquants (Zabala 3402, Colegiales) is the best macarrons in Buenos Aires. Paul French Gallery (Gorriti 4865, Palermo Soho), by interior designer Pablo Chiappori, a fascinating world of good taste. Along this courtyard, a giant warehouse containing exquisite interior decoration products that coexist with objects of desire of all kinds. Arte Étnico Argentino; naturally dyed weavings, hand-hewn wooden basins, tables carved from a single tree trunk are some of the fabulous pieces hand-made by indigenous craftsmen at this shop-slash-gallery, run by Ricardo Paz. Proa Fundación , BA top art foundation, houses some of the best contemporary art exhibitions, including Louise Bourgeois (2011) and the biggest southamerican restrospective by Giacometti. It has a excellent art book shop and a cafe attached to a rooftop patio with a fantastic harbor view of La Boca. Malba (Museo de Arte Latinoamericano de Buenos Aires), opened in 2001, plays a central role in Buenos Aires’s artistic and cultural life. You can find a permanent collection of more than 500 paintings, sculptures, and objects from top Latin American artists (including Diego Rivera, Antonio Berni, and Guillermo Kuitca) and temporary exhibitions, from the likes of David LaChapelle and Roy Lichtenstein.